Vinous Readers, moving along from the last few blog posts about the happenings at the 30th Anniversary Pre-Conference of the wine fair, the next few posts will be about my reflections/good times of the three days of the 2010 London International Wine Fair and we all know there were good times to be had, 'cause "the party don't start 'til I walk in"!!! ‘Cause its an hour long ride on the Metro Line!! Anyways Vinous Readers, moving along from the last few blog posts about the happenings at the 30th Anniversary Pre-Conference of the wine fair, the next few posts will be about my reflections/good times of the three days of the 2010 London International Wine Fair and we all know there were good times to be had, ’cause “the party don’t start ’til I walk in“!!! Here are two videos I so lovingly took for all of you on the first day at the fair! After walking around and taking some video footage for y’all, my first stop of the day was to the Wine Intelligence Booth. Wine Intelligence is a global company dedicated to supporting wine businesses and associations through consulting, branding & market research. They are a family-owned and managed business founded in 2001. Their core team is based in London, but they work work in all current and emerging global wine consuming markets. For more information on Wine Intelligence you can visit their website or read their company online brochure. The presentation I attended was titled: Generation Wine: Getting to the heart of Millennial Wine Drinkers around the world. As you can gather from the title, it was about this crazy generation labeled the “Millennial’s” aka “Generation Y” aka “Echo Boomers”. There isn’t an exact year definition for this generation but it is roughly those born between early 1980’s and mid 1990’s, (children of the baby boomer generation). Although the qualities of this generation can differ from country to country, the Millennial’s are generally associated with growing up around computers/internet, increased forms of communications/media/digital technologies, and raised with a neo-liberal approach to politics and economics. But most importantly, they drink the hell out of wine!!! (I can certainly vouch for that because I am a Millennial. I would even go so far as to say I take up a large piece of the pie chart for Millennial wine consumption =P) The Wine Intelligence group understood the importance of the generation and their current and potential impact on the wine industry, so they conducted some research. You can see a great summary of the findings they presented at the fair by clicking this link to the PDF Fact Sheet. The other fact sheets from all their other presentations at the fair are available on this link to their website. The topics include research on Fine Wine Consumption, Wine Branding, the Wine Industry’s in North American, China, the UK, etc. They are all quite an interesting and won’t take long to read at all. The presentation ended around 11:30am and I decided it was close enough to noon, the socially acceptable hour to begin drinking. (Unless you are in Cancun or some other beachside resort, then I think it changes to 10am right?) Besides, as much as I love wine, tasting it anytime before 11am is just what I consider a rude awakening =P Although my earliest record for a legit wine tasting is 8am. Yes, 8am. It was for a wine knowledge class this year in my Masters In Wine Business Program. It was brutal. I still cringe like a lost child in a forest. Uhhhhggghhh! Milbrandt Vineyards – Washington, USA. They have 1600 acres spanning over 13 vineyards. Butch and Jerry first planted vines in 1997. They made a reputation for themselves for growing/selling some of the best grapes in Washington! In 2005 they decided to make wines under their own label, so they founded a winery. Their first wines were released in June 2007, so they are fresh on the market! Get ’em while they’re still “hot”! Traditions 2008 Riesling (Columbia Valley) – for those who are familiar with Washington Rieslings, this is the definitely THE benchmark style for Washington. Hints of citrus, pleasant green notes, slight white flower, honey, stone and the slightest sweet finish. At under $15, this is one to look out for. It is 100% Riesling coming from 4 different sites. Here is the fact sheet for the wine. Traditions 2007 Merlot (Columbia Valley) – smooth, silky, red and dark fruits, toast, vanilla, caramel, , chocolate and oh so soft and balanced. This wine spent 10-14 months in a oak. At under $15, this is incredible quality for price. It is 79% Merlot, 17% Cabernet Sauvignon, 2% Malbec, 2% Petite Syrah coming from 12 different sites. Here is the fact sheet. The Estates 2007 Mabec (Wahluke Slope) – dark red fruits, spice cake, herbs, chocolate, rich and silky. Spent 14 months in oak and is 88% Malbec, 6% Cabernet Sauvignon, 3% Merlot, 3% Syrah coming 100% from their Northridge Vineyard. Here is the fact sheet. For under $30, this mouthwatering wine is one you should buy for that nice dinner on the weekends, or every night if you can afford it! Extra, extra Yumm! FYI: The Wahluke Slope AVA was just added in 2006 and is a sub-region within the Columbia Valley appellation. On a side note, check out their cool concept for the back label. There is a peel-away portion that gives a food pairing for the wine!! Owned by George Hillberry & Ryan Harms (two veterans of the Oregon wine industry) and represented at the fair by their national sales manager, Justin Hoffman, their approach is simple: combine quality and value to produce a wine anyone can enjoy, any night of the week! I can live with that! Underwood Cellars 2008 Pinot Noir – subtle hints of vanilla, loaded with ripe dark fruit. Comes from Umpqua Valley (90%) and Rogue Valley. It is aged 10 months in 10% new French oak. Here is the fact sheet. Not bad for an entry level Pinot Noir. Kings Ridge 2008 Pinot Noir – dark red fruit, a bit of toasty smell, nice acidity. Great combo of fruit and smooth tannins. It is aged 9 months in both new and neutral French oak. 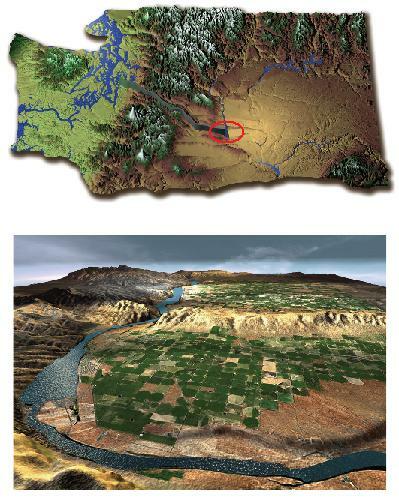 It comes from the Willamette Valley (52%) and Umpqua Valley. Here is the fact sheet. After my State-side wine tasting, I went off for a quick lunch and had some pie! And boy did I!! After making some sweet, sweet love to my pie, err..ugh, I spent just about the rest of my day at the ACCESS ZONE!! Here is a video of the ACCESS ZONE that I earlier in the morning before the crowds came! The Access Zone was THE booth for any and all things online for the wine industry. It was a press area of sorts for social media users, a place where all us wine bloggers could socialize in a non-virtual setting =P, the place for wine industry professionals to learn/seek advice for any of their wine online needs, there were all kinds of presentations for an array of ‘wine online’ topics (you can see the presentation line up here), different wine tastings were put on, there was a room for recording video interviews … the list goes on and on!! The Access Zone was hosted by Catavino (from my previous post!) and was the first booth of its kind!! It was incredible to be there. I spent a huge chunk of my time at the London Wine Fair there because this is a part of the wine business sector I am the most attracted by. And after 3 days of the people I met and chatted with, I know I am not alone! One of the presentations I learned a lot from (and also made a new friend!) was given by André Ribeirinho, the CEO from the ‘social wine discovery service’, Adegga. The idea behind Adegga is to take the complexity out of wine and allow people to discover wines based on other people’s choice. Adegga also helps you organize your wines. You can keep track of wines you taste, make a wish list or organize your home cellar. Adegga lets you build a personalized watch list so that you can keep track of what people on your list are choosing and tasting. You can add friends, wine bloggers, producers and just about anyone else. You can also add wine producers and wine shops to your personalized watch list so that you keep track of when a producer releases a new wine or a wine shop makes a promotion. It has been referred to as the “facebook” for wine lovers. You can read more about it here. Andre was such a fantastic guy! I was lucky enough to get to know him over the course of the three days, along with many other amazing folks at the Access Zone (you know who you are!) and he/they is just downright genuine, goodhearted, and damn hilarious people. And if someone like him is the brains behind this Adegga site, I know there definitely has to be something great about it! Andre, if you are reading this, it was a pleasure to meet you! Look forward to lots more fun times with the rest of the wine-online crew both ‘virtually’ and on the lucky opportunities when we all get to meet up in person! Lastly, another of the presenters of the first day was a particularly special one, Willi Klinger of the Austrian Wine Marketing Board. Why is that so important? Well, the Austrian Wine Marketing Board are premium sponsors for the 2010 European Wine Bloggers Conference that will take place on October 22-24, 2010 in Vienna, Austria. Willi Klinger, President of the Austrian Wine Marketing Board, shared his thoughts on why Austria feels social media is important and also gave us an incredible tasting from three different Austrian wines! Here is evidence that I was blogging live from the Access Zone! haha! The European Wine Bloggers Conference (EWBC) is the only international event dedicated to the convergence of wine on the web, providing a platform for the global wine community to openly address today’s new wine media. If you are interested in join bloggers, journalists, wine industry professionals and social media innovators on October 22-24 in Vienna, Austria, to discuss the convergence between the culture of wine and the web, visit this website ~ http://winebloggersconference.org/europe/ ~ There is also information on the site if you, or know someone you know, would be interested in sponsoring the EWBC. Hope you enjoyed my reflections on my first day from the London International Wine Fair! Hope you learned something and I hope I made you laugh!